We stopped at the Merida Bicycles flagship store to look about. Though Merida has a high-profile in Taiwan, they are mainly known as the manufacturing partner for just about all of Specialized, as well as others. In the flagship store Merida had bikes that spanned the spectrum of affordable to premium, but what grabbed my attention was the shoes. 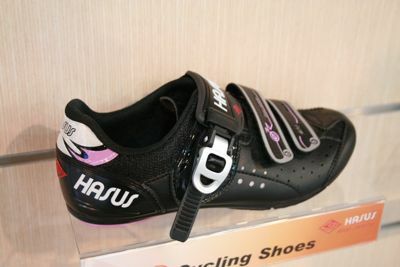 The store prominently displayed a brand called Hasus, and I’ve never heard of them before. The shoes bear an overwhelming resemblance to a certain famous Italian cobbler (hint: sounds like “CD”), but when I turned the shoe over to see what kind of mounting system it had, HELLO! …..no mounting system at all. 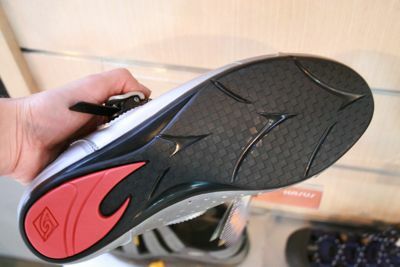 The sole is fairly stiff and not very grabby….I thought it was just hard plastic at first (I’m still not sure). VERY curious design. 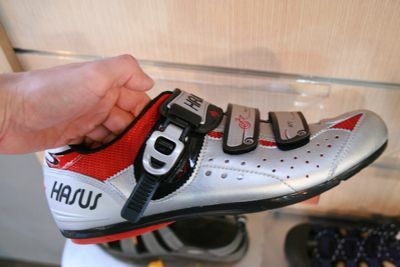 A high-tech shoe for toe clips?